Baker is an outstanding handquilter who attends to details. She grew up in a home without a sewing machine. Her mother mended by hand, and her grandmother was a spinner, knitter, quilter and tatter. She began embroidering at the age of 10 and continued with crewel embroidery, counted cross stitch and crochet. 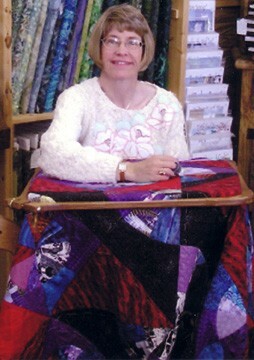 In 1993, she took up piecing and quilting by hand. She was an instructor at the 2004 and 2005 quilt retreats with rave reviews. Phyllis and her husband, Mike, own and operate a farm in Lucerne Valley near Thermopolis.